The surveyor’s confidence was building from this and he soon got the knack for identifying the GFRP rebar that wasn’t showing to well at first. 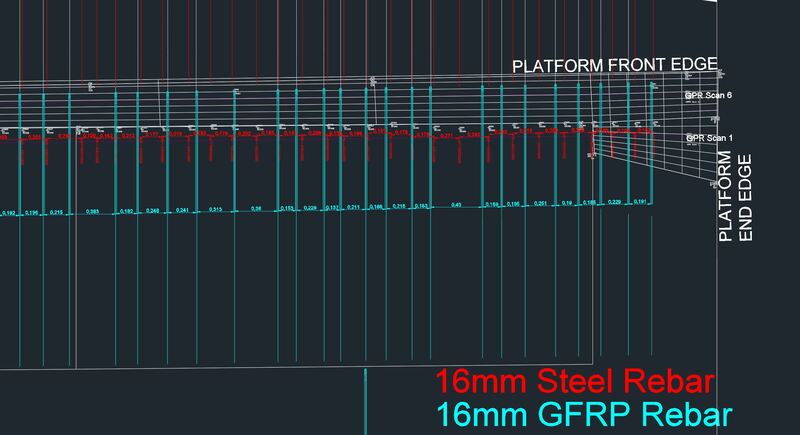 The surveyors worked as a team and with their setting out producers working well they covered over a 1000 meters with the structure Scan mini marking all the steel rebar and GFRP rebar that they could see on the screen of the structure Scan mini. Spaced at approximately 200mm apart they recorded 3500 pieces of steel & GFRP Rebar. But it didn’t stop there.